Idea of surprising someone you love at midnight is really a gratifying feeling. Isn't it? Express your love for your special one and friends in a special way that they can never forget. With FlowerAura's midnight gifts delivery, surprise your loved ones with delectable cakes, meaningful gifts, and aromatic flowers at midnight. Relationships form an integral part of our lives. The major reason we feel warm and contended is that we share some cherish-able bonds with people in our lives. Some meet us as we move ahead in the journey of life as friends while we are blessed to have some as mother, father, siblings and soulmate. Well, relationships are countless and each needs to be cherished and tendered. And it could not be done just by way of words. You need to also make sure to add an element of surprise and timeless expressions to your relationships. And what better way to do the same than by choicest tokens of love for them coming with late night delivery of gifts? And when it comes to making a pick, it’s not just the effort that counts but the choice of gifts as well. It should suit the person you are giving it to. For such times, count on FlowerAura that has an extensive assortment of gifts to choose from. FlowerAura is the best place to be if you are looking for the most adorable gifts for your loved ones. From flowers to cakes, teddies and combos, FlowerAura has it all to offer and make your present heart warming and love filled. Some of the picks include Cuddly Choco Odyssey, Ultimate Fantasy, Choco Dream Bonanza, Rosy Celebrations and so forth. Not just this, FlowerAura also comes with an option of midnight delivery of gifts so that you can add an extra pinch of love to your surprise. 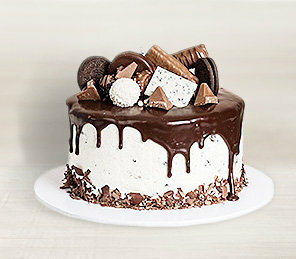 Besides, when it comes to making celebrations grander and better, cakes always play a major role in it. How about opting for a midnight delivery of cakes for your loved ones? If it is a birthday, a late night birthday surprise would be the best option. Besides, you can also deliver the freshness of flowers to your loved one’s doorsteps and create a special moment for them. Just count on FlowerAura for all your needs. FlowerAura’s hassle free delivery process is something you should always rely on. Whether it is midnight delivery of flowers or gifts, make sure you make a pick from FlowerAura and bring delight to your loved ones. FlowerAura’s prompt delivery service across 170+ cities is here to make your work easy. Now you can sit at the comfort of your home and order for late night gift delivery in India and have your surprise delivered anywhere! So go on, make moments special with FlowerAura.